All of my Blends (blogger + friends) are amazing. Truly, Such.Great.People. And creative too! It's so wonderful to have like-minded, supportive, inspiring people around you. Which brings me to my friend Gina, from Running to the Kitchen. I read a lot of blogs each week, but she stands out as one of the best. She continues to produce top quality recipes, photos, and stories day after day after day and has a knack for getting me to laugh out loud at my desk. I seriously love this girl! 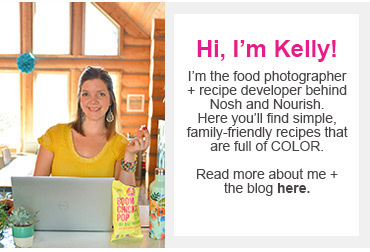 She recently created a blog post series called "From Bookmark to Blog" where she cooks some of her favorite recipes that she finds on other people's blogs. Genius! 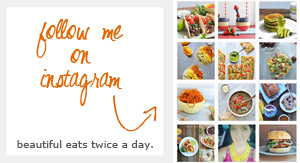 I plan to do these kind of posts regularly because duh, I'm not the only one that creates fabulous recipes. AND, it's a great way to branch out into new foods that I've never tried/cooked. 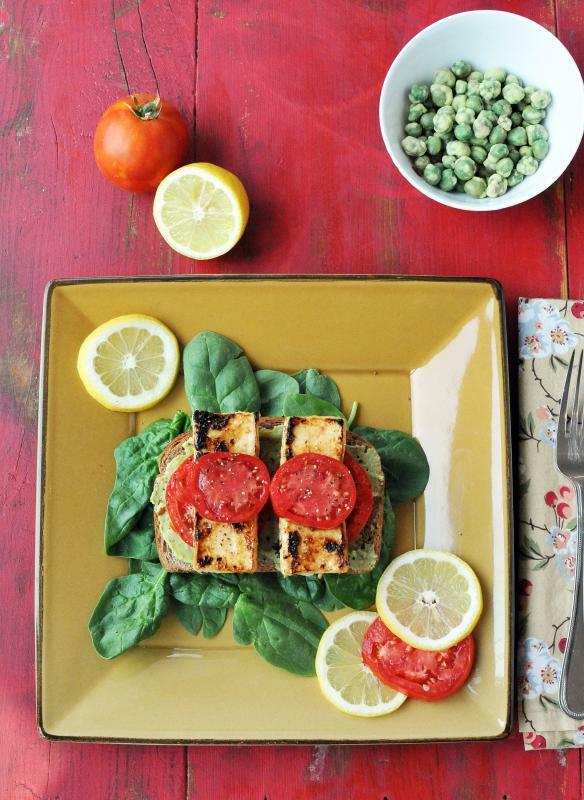 I've been wanting to cook more vegetarian meals, so I forced myself to buy some extra firm tofu at the market. It sat in the fridge untouched for over a week. I had to muster up the courage to cook it. I even wrote about in Tuesday's Tutorial Post how I planned on doing a "How to Press/Cook Tofu" tutorial in the coming weeks. But, then I came across this recipe and my life was forever changed. A tofu recipe that said I didn't have to press the tofu for hours. What?! I thought that was a hard-and-fast-tofu-cooking-RULE! Instead, I could just blot the tofu in some paper towels before pan-frying it. Oh.M.Geeee!!! So the simplicity of the recipe is what first appealed to me, followed by the beauty of her photos and the fact that I had a bunch of homegrown tomatoes in my garden begging to be used. It took about 15 minutes to make, and about 1.5 minutes to eat devour. It was mind-bogglingly good. Seriously, I still can't believe it!! 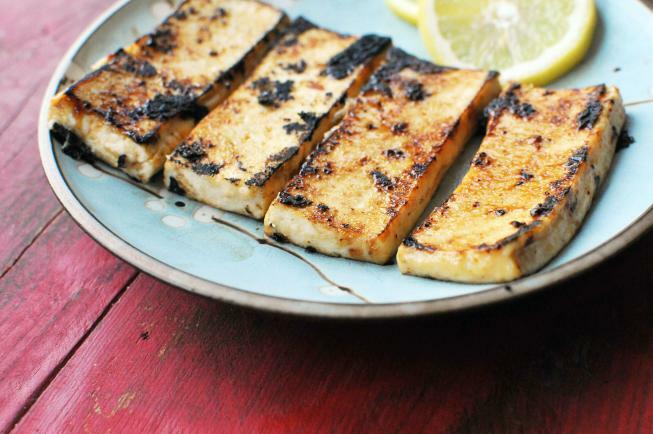 If you've never tried tofu before, try this recipe. You won't be disappointed! I followed her recipe to a T (using agave nectar for the tofu), but added some of my greek yogurt/avocado/almond spread to the toast before layering on the tomatoes & tofu. 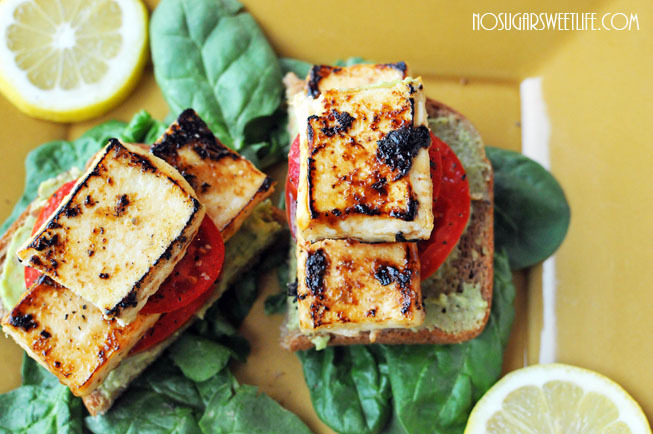 Tomato and Lemon Tofu Sammies, 15 min from start to finish! 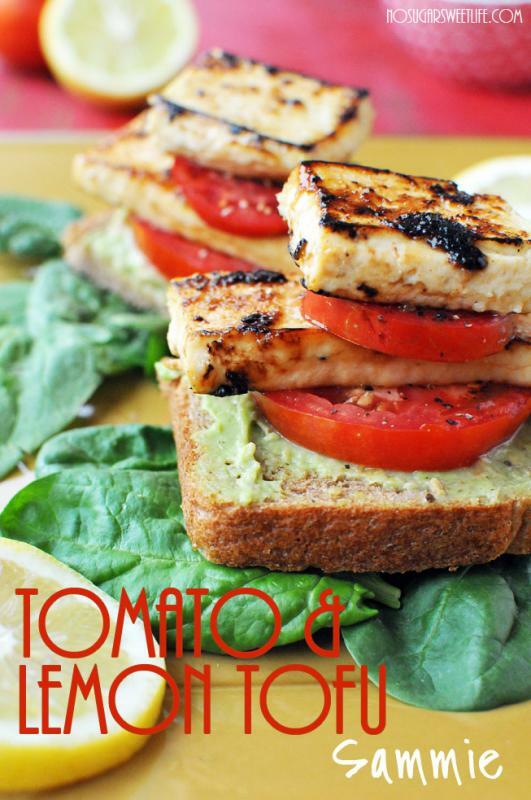 Plus add some of my greek yogurt / avocado / almond spread to the bread before topping with tomatoes & tofu.